“Terrorists should not be able to buy weapons and the FBI should be notified if a suspected terrorist buys a weapon," Kirk said in a statement. In the wake of the mass shooting at a gay nightclub in Orlando, Sen. Mark Kirk introduced new legislation Thursday that would alert the Federal Bureau of Investigation if a terror suspect attempts to buy a gun. If passed, the legislation would ensure that any individual who is, or has been, investigated for potential ties to terrorism is entered into the National Instant Criminal Background Check System (NICS). If someone who is, or has been, investigated for possible ties to terrorism, the measure would require the NICS to automatically notify the pertinent division of the FBI. The FBI currently conducts background checks for every gun purchase using the NICS. The screening checks if a potential buyer has felony commissions, mental illnesses or a history of domestic violence or drug abuse. The legislation wouldn’t automatically bar someone who was investigated for having possible ties to terrorism from buying a gun. It would only require that individuals are entered into the NICS system and that the FBI would be notified if they attempt to buy a firearm. Kirk, who introduced the bill alongside Democratic Sen. Bill Nelson of Florida, has broken with Republicans in the past to support gun control. Following the 2015 San Bernadino shooting, Kirk was the only Republican to cross party lines to vote on a failed Democratic “no fly-no buy” proposal that would have denied people on the terrorist watch list the ability to buy guns, MSNBC reported. Kirk continues to express support for “no fly-no buy” measures. According to NBC News, Senate Democrats ended a nearly 15-hour filibuster early Thursday after Republican leaders reportedly agreed to vote on two proposed gun control measures, including the bill that fell short in 2015 that looks to prevent terror suspects from buying guns. The other bill deals with expanding background checks sales at gun shows and online. 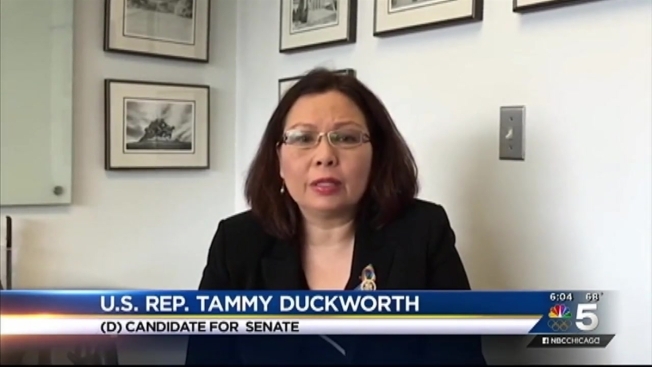 Rep. Tammy Duckworth, who will face Kirk in the November election, chastised the senator for not speaking out during the filibuster in a video released Thursday. She also asked voters to urge Kirk to speak on the Senate floor about gun violence prevention and to vote affirmatively on upcoming legislation. "While the epidemic of gun violence has touched far too many cities accross our county, here in Illinois, 69 people were shot in Chicago over Memorial Day weekend alone," Duckworth said in the video. "For Mark Kirk to continue representing our state while failing to show leadership on this issue is shameful." "Illinois deserves a senator who will champion legislation to reduce gun violence," the congresswoman added. In the video, Duckworth also promised to continue pushing for control measures. Meanwhile, Kirk released a statement Thursday urging Duckworth to testify in the August 15 workplace retalliation trial that accuses the congresswoman of ethics violations while she led the Illinois Department of Veterans Affairs. "Duckworth should testify at her trial and provide the public with answers and justifications for her actions, but I doubt she will," Kirk said in a statement. "I expect Duckworth to continue to hide from this trial and refuse to answer questions because there simply are no good answers for how she sought to protect former Governor Blagojevich and herself from these failures." Illinois Rep. Robert Dold, who is also facing a tough reelection bid, broke with fellow Republican lawmakers Tuesday, calling for expanded gun control legislation in the wake of Sunday’s massacre at an Orlando nightclub. “Thoughts and prayers are not enough and it’s time for action,” Dold said in response to the attack. Dold joined Democratic lawmakers Tuesday, pushing lawmakers to take votes on bills that would prevent terror suspects from buying guns or explosives, require universal background checks for gun purchases and bolster the system for background checks.